I love homemade Christmas tree ornaments, don’t you? When our older kids were in public school and our twins went to mother’s day out, every year they made homemade ornaments. This was always a treat and I have always cherished them! I have ornaments my oldest, who is now 15, made when he was three years old. They are gorgeous on our tree! 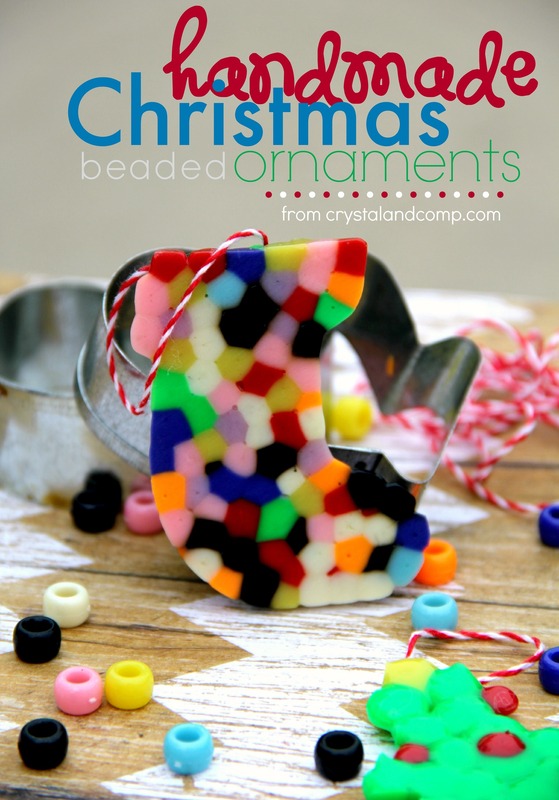 I am going to show you how to make these beaded ornaments in 20 minutes! Super easy. Matthew (5) and I had a blast yesterday making them! 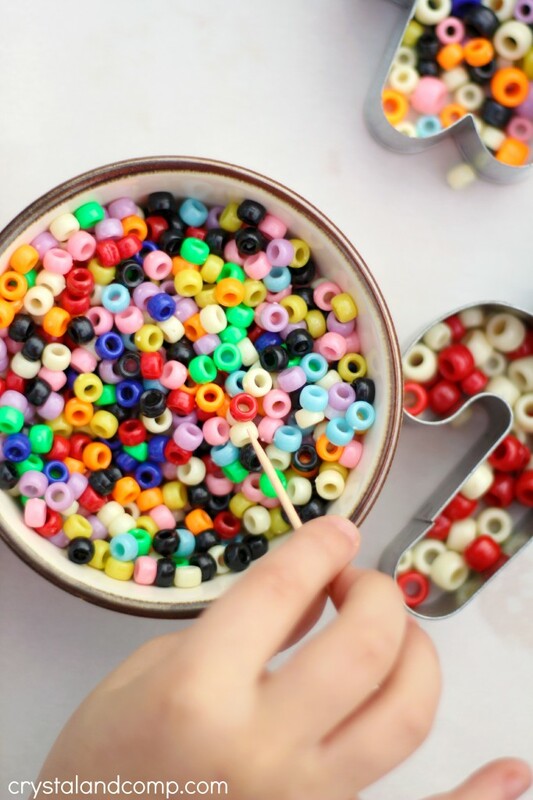 IF YOU ARE CONCERNED ABOUT THE PONY BEADS BEING TOXIC, TRY THESE PERLER BEADS. Lay out the cookie cutters on the cookie sheet. 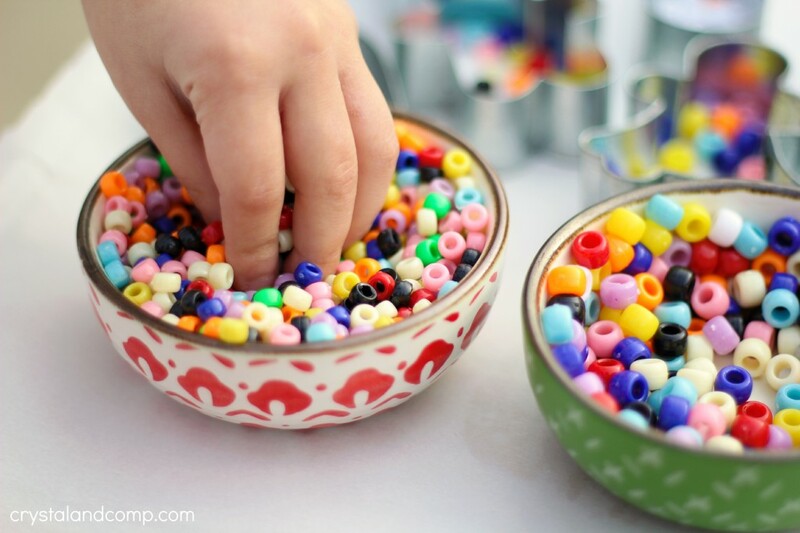 Have little hands begin to fill each cookie cutter with beads. We did a combination of small and large. You can arrange colors, for example when making snowman eyes and nose. For the candy cane we just used cream and red beads. We did not put them in any order. For a Christmas tree we just did all green and then one yellow bead at the top of the tree and a red bead here and there for lights. You can use a toothpick to make this a fine motor activity for kids. The toothpick does make it easier to fetch specific colors from the bowl. This is how we spread them out on the cookie sheet. Now you are going to pop them in the oven for 15-20 minutes. Once they have melted, remove them from the oven and let the cookie sheet sit to cool. 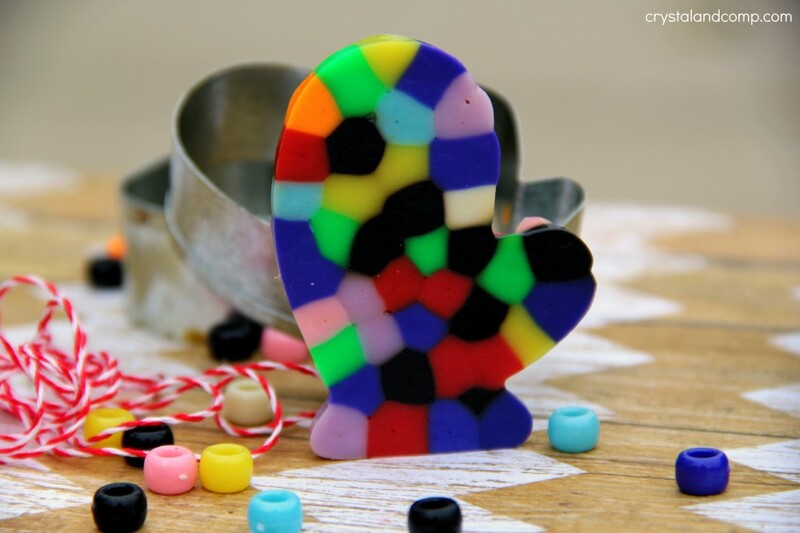 Once they are cool to the touch, apply pressure to the inside of the bead creation and pop them out of the cookie cutter. This is defiantly a grown up job or a job for older kids. The backside of the ornament is flat and the side you want to present at the front of the ornament. On the back of the ornament apply a dot of hot glue. Take 5 inches of twine and make a loop with it to serve as the ornament hanger. Matthew was so proud of himself for helping me make these ornaments. We are going to make more and send them to grandparents! 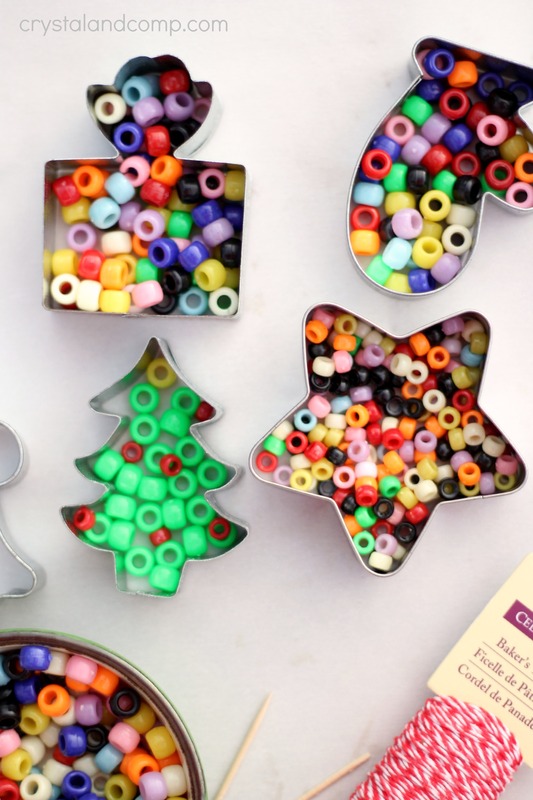 If you would rather use perler beads here are supplies to consider. Do you love making homemade ornaments together as a family at Christmas? Check out our Elf on the Shelf Perler Beaded Ornaments as well. 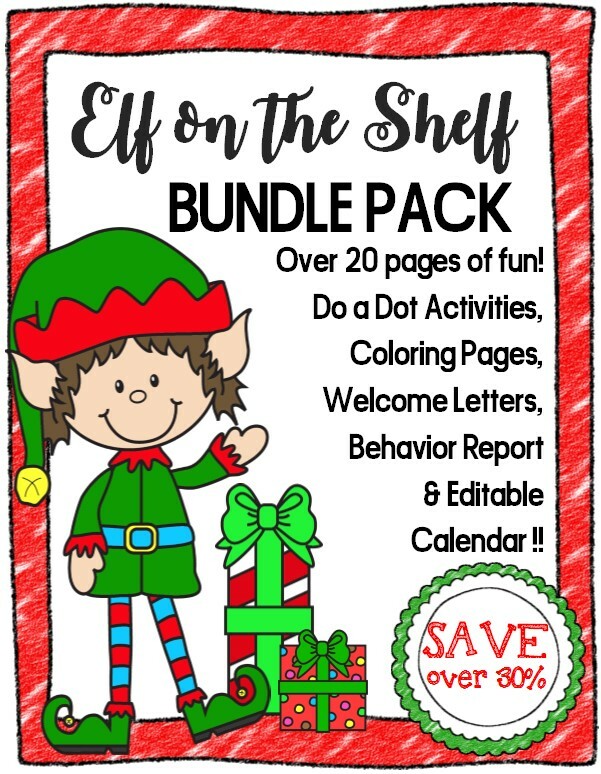 They are SUPER CUTE, so easy to make and perfect for Elf on the Shelf to bring. 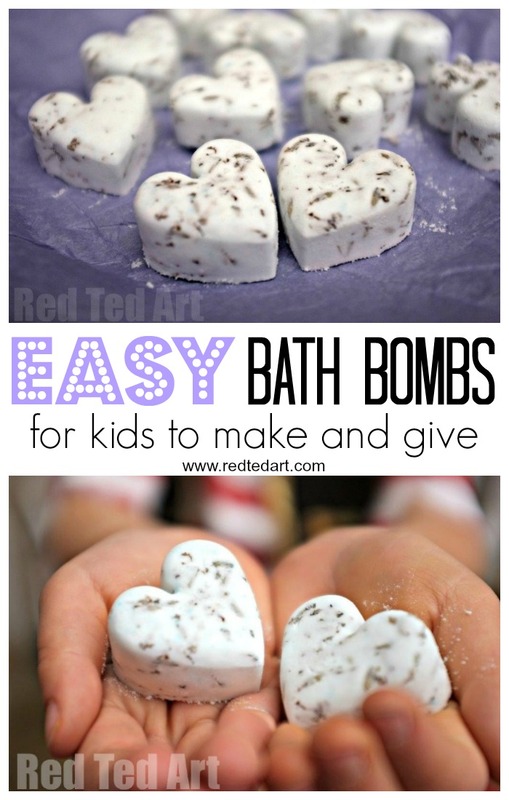 Looking for a gift kids can make and give this Christmas season? This bath bomb recipe is amazing! These are absolutely gorgeous and so simple too ! I made these today with Hama beads (Hobbycraft thought they’d work) – unfortunately they don’t come out of the cookie cutters – any ideas? Thanks! No clue. We have no problems getting our the perler and pony beads. Did you try putting some oil on the cookie cutter? Just a thought. You can probably reheat when really hot pull off cookie cutter and run a sharp knife around edge to help remove anything left. Try cooking spray perhaps next time or get suggested beads. 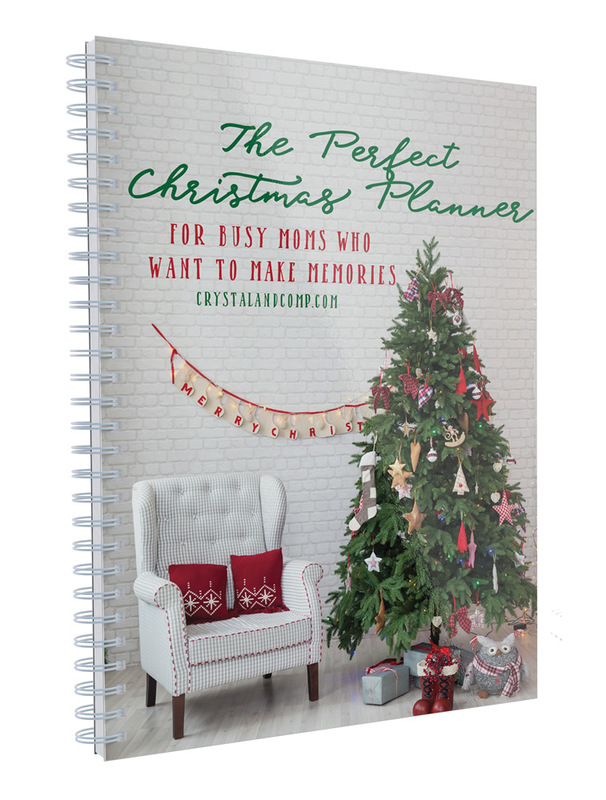 Wow, Crystal…these ornaments are so cute! Thank you so much. We had fun making them and they are so easy! This is great! We have pony beads and my daughter loves playing with them so this should be fun. Can’t wait to try! Thanks for sharing at our FB share day!! Wow…those look so nice. I can’t believe the beads melted enough to stick together like that. When I was a kid I made some ornaments out of a very firm cookie dough and then we painted them. I only just recently got rid of them when we moved. Love that these are beads. How neat! I thought they were perler beads at first. I didn’t even know that you could do that with these. I love ornaments like this. They’re homemade and lovely. The kids get to work on their small motor skills which is always a good thing too! Beautiful! Those look so cute! And they’re so easy to make too! I don’t have kids yet but this can be a fun activity for me and my nephews and nieces. Bet they’ll love it! Homemade Christmas ornaments are the best! These totally remind me of my childhood. This looks like a craft that my daughter would love to do! 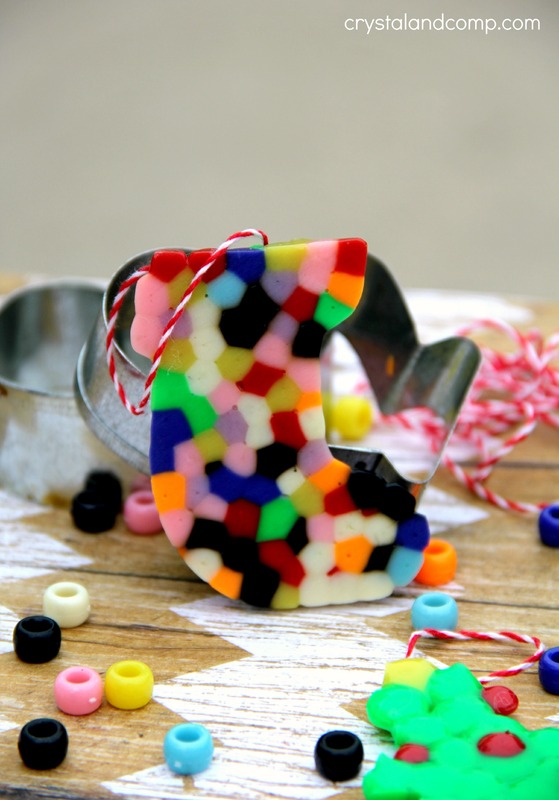 I never thought to use cookie cutters like this to make the shapes, what a great way to make holiday ornaments. The possibilities are endless for what you can make. I was baking these and then after 5 mins or so they started burning and their was smoke all throughout my house. What do you think happened? Did they also start depositing smoke? Did this leave any residue on the cookie cutter? Are they still safe for making regular cookies? I did not notice any residue. It’s up to you if you want to still use them for cooking or exclusively use them for play. We use a lot of cookie cutters for play and crafts. I have no idea if it is toxic. I made them last year and did not feel unsafe doing it. I put mine on the grill to avoid fumes in the house. It worked. At my daughters birthday party, we made sun catchers the same way. They turned out super cute and the girls had a blast. We used the gas grill outside to melt the beads. There is a little bit of a plastic smell when the beads melt, and using the grill kept that smell outside. I also was able to use my hubby’s drill and drilled holes in the top for the hanging ribbon. 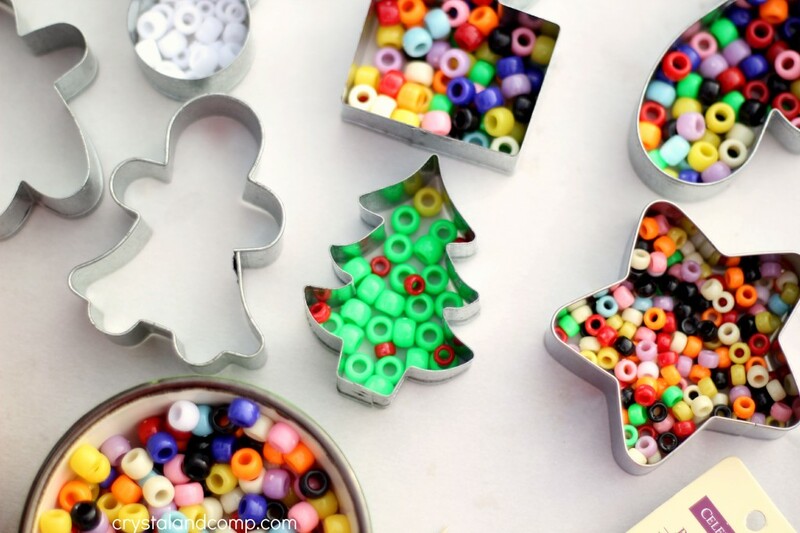 I love the idea of making ornaments!! 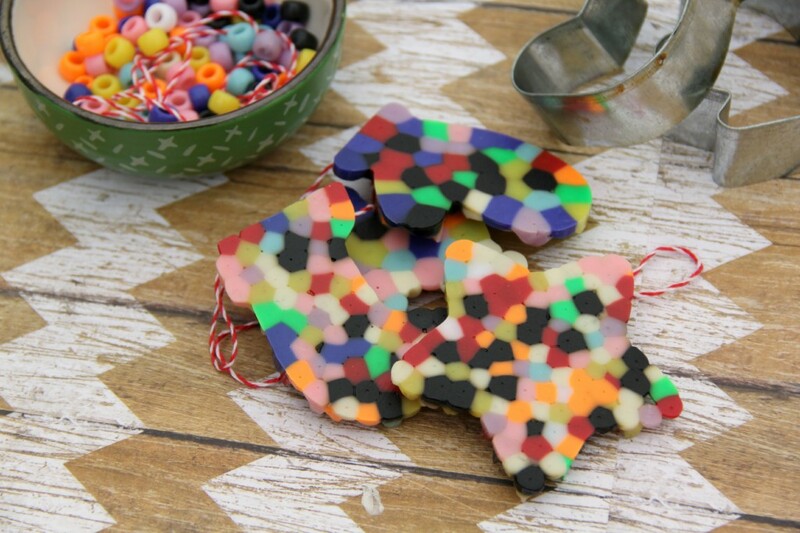 When i tried this, my beads melted but didn’t become molten and spread to fill gaps and complete the shape. Did i not put enough beefs in our do i need to leave them longer? I was wary of leaving them too long as I’ve seen crispy remains of others’ attempts at this kind of craft. 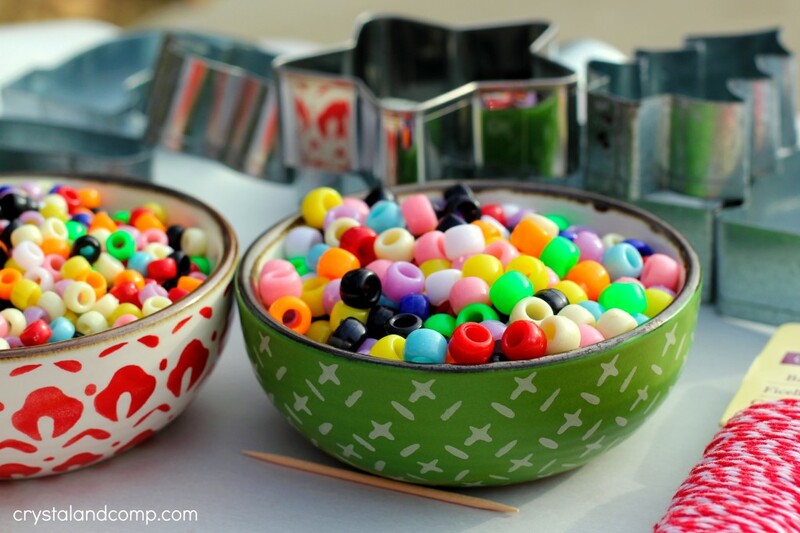 It’s possible you did put enough beads in the molds. Love these Christmas Hanging Ornaments. What a great idea and quick too. These are so adorable! And seem pretty easy. I have never worked with the beads, is there an odor when you heat them? I have someone living in my house who can not breathe well if there is an odor too strong, like I have no scented candles and have to be careful what perfume I wear. I definitely need to give this a try. These ornaments are gorgeous! Thanks for sharing at Funtastic Friday. I would be afraid of the toxicity of the fumes from melting plastic! Not willing to risk it! Try putting them on an outside grill if you have one.